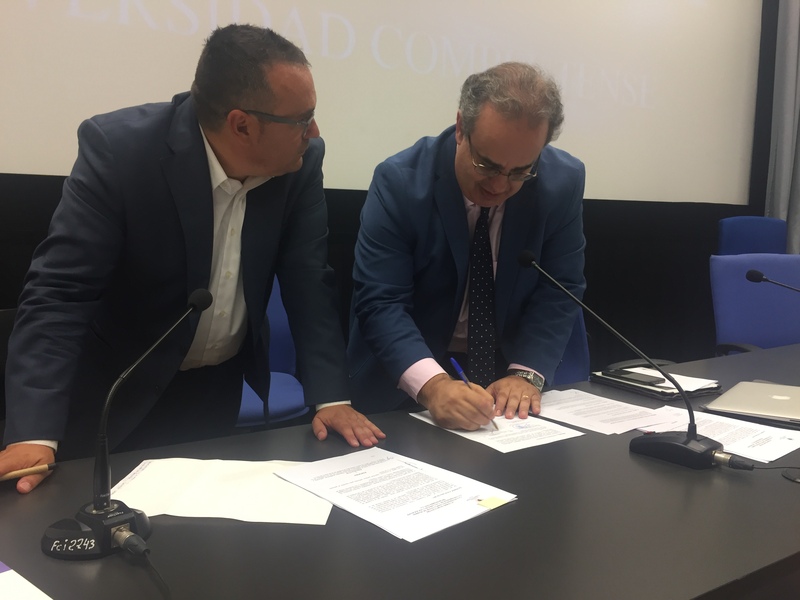 The Complutense University of Madrid (UCM) and University of Valladolid (UVa), through the colleges of Information Science and Business respectively, and the consulting firm Sociograph sign a framework partnership agreement to set up a new innovation unit for both university students and professionals belonging to the media sector. As a result of this agreement, the university, located in Madrid, will be equipped with a work space to promote the research and training, as well as implementing a mutual and third-party cooperation framework as a bridge-builder between the academic world and the working environment through a new business-university partnership. The initialling of the agreement took place at Sala Naranja of the College of Information Science in Madrid on Monday, 26 June, 2017. Among the attendees, the standouts were the Dean Jorge Clemente Mediavilla and the Director of the Communication Advertising Department I Patricia Núñez Gómez of the host College, the Dean of the College of Business José Antonio Salvador Insúa, and Enrique Hornos Redondo and Elena Martín Guerra, CEO and COO of Sociograph, respectively. After signing the agreement, a wine reception was hosted for the attendees. The Marketing Director of Mediaset España Javier López Cuenlla was the guest of honour at the agreement ceremony as a representative of the largest Spanish television network and media production company, which relies on and support the integration of neuroscientific techniques in the media sector. A sector that represents 9.4 % of the European Gross Domestic Product (GDP). Both the UVa and UCM, therefore, continue working on their talent search supported in the research, training and business collaboration and based on the latest agreements reached by the European Union to develop and improve the university education.